On the eve of war with Syria: John Kerry's "Colin Powell moment"
Ten years after the US government went to war in Iraq on the basis of lies about nonexistent weapons of mass destruction (WMD), a no less grotesque provocation is being concocted by Paris, London, and Washington to justify a new war of aggression against Syria. The allegations that the regime of Syrian President Bashar al-Assad carried out mass chemical weapons attacks last Wednesday in Ghouta, near Damascus, lack any credibility. The Assad regime has no motive to carry out such an attack. Until Wednesday, its forces were handily defeating the US-backed opposition militias without using chemical weapons. Due to their lack of popular support and the repeated defeats they have suffered, the opposition is disintegrating into bands of looters and murderers--a state of affairs confirmed by Al Qaeda-linked opposition forces' declaration that after the Ghouta a ttack, they will kill any member of Assad's Alawite faith they capture. Allegations that Assad used chemical weapons serve only one purpose: to give Washington and its allies a pretext to attack Syria, which they have repeatedly threatened to do if a chemical attack by the regime occurred. If a chemical weapon attack did take place in Ghouta, François Hollande, David Cameron, and Barack Obama know far more about its execution than does Bashar al-Assad. Before any proof of a chemical attack had emerged, and before any investigation had even begun--indeed, in less time than police departments take to issue an indictment in a routine street crime--French and British officials were calling for war with Assad. The day after the alleged attack, French Foreign Minister Laurent Fabius insisted that "force" was the only appropriate response. Obama administration officials even said th at they did not want a UN investigation or the collection of evidence before proceeding with their war plans. They told the New York Times yesterday that, with target lists for US strikes in Syria already circulating at the White House, they were "determined not to be drawn into a protracted debate over gaining access for United Nations investigators, because of doubts that they could now produce credible findings." The Obama administration's claims that it is going to war because it is concerned that a "red line" of chemical weapons use has been breached is utterly fraudulent. It does not intend to investigate what occurred in Ghouta. Rather, it wants to obtain a pretext for war that it can present as "credible" to the media, to justify military action that it intends to pursue regardless of whether the Assad regime used any chemical weapons. Paris, London, and Washington are rushing into a war wit h far-reaching implications. US guided missile destroyers are heading to the eastern Mediterranean to get in position to strike Syria, and military planners are preparing a massive bombing campaign and stepped-up weapons shipments to Islamist opposition militias in Syria. They are dismissing blunt warnings by Syria's allies, Iran and Russia, that a US attack on Syria will have dire consequences throughout the region. The geostrategic and economic interests driving war preparations against Syria were spelled out in a long statement by one of US imperialism's leading strategists, Anthony Cordesman of the Center for Strategic and International Studies, issued two days after the alleged chemical attack. He wrote, "If Bashar al-Assad wins or survives in ways that give him control over most of Syria, Iran will have a massive new degree of influence over Iraq, Syria, and Lebanon in a polarized Middle East divided b etween Sunni and Shi'ite and steadily driving minorities into exile. This will present serious new risks for an Israel that will never again be able to count on a passive Assad. It will weaken Jordan and Turkey and, most importantly, give Iran far more influence in the Gulf. BP estimates that Iraq and Iran together have nearly 20 percent of the world's proven oil reserves, and the Middle East has over 48 percent." To achieve the objective of removing all impediments to their control over the vast oil reserves of the Middle East, the imperialist powers, led by the United States, would gladly organize the deaths of hundreds of thousands of Syrians, just as they did in Iraq. There is deep opposition in the working class in the United States and Europe to being railroaded into another war for oil and geopolitical advantage. One Reuters/Ipsos poll published Saturday shows that only 9 percent of the US public supp orts US intervention in Syria, and only 25 percent would support it even if it were proven that Assad had used chemical weapons. Well aware of this public sentiment, the American and European media say nothing of the interests underlying the war plans and subject none of the Islamist opposition's accusations to critical examination, even though it is well known that these forces have ties to Al Qaeda and routinely lie to the press. The stench of lies surrounds this latest operation by a state-controlled media to roll out a pack of WMD lies to justify yet another war of aggression. As for the imperialist powers' claims that they are attacking Syria out of a humanitarian urge to protect Syrian civilians, these statements deserve nothing but contempt. They are moving to start another bloody war only days after sanctioning the slaughter of thousands of unarmed protesters by Egypt's US-backed military junta. Workers and youth must oppose the war that Washington and its allies are threatening to unleash in Syria. Until they are stopped by a movement of the working class, the imperialist powers will go well beyond war with Syria in pursuit of the agenda outlined by Cordesman. Besides the countries already devastated by fighting spilling over from Syria, such as Lebanon and Iraq, the imperialist powers have Iran, and ultimately Russia and China, in their sights. Yesterday, US Secretary of State John Kerry appeared on national television to deliver a lying statement aimed at preparing public opinion for an impending US-NATO attack on Syria. It was his very own "Colin Powell moment." On February 5, 2003, Powell, then the secretary of state in the Bush administration, made an infamous presentation before the United Nations. For two hours, armed with photos, graphs and audio tapes, the chief diplomatic officer of the United States made the case for war against Iraq. He claimed that the evidence he presented showed that Iraq had weapons of mass destruction (WMD), which it was about to unleash on the world. The media and politicians of both parties hailed Powell's performance, declaring that the former general had made an overwhelming case that Iraq had enormous WMD programs. Six weeks later, bombs fell on Iraq as the US invasion began. Powell's speech was a pack of lies. Not one of his claims about yellowcake uranium from Niger, aluminum tubes, or mobile weapons labs was true. At the time, the WSWS wrote that the brief for war was "a diplomatic charade laced with cynicism and deceit... predicated on a colossal lie: that the coming invasion is about Iraqi weapons of mass destruction and Baghdad's supposed threat to US security and world peace." And so it proved to be. The speech ten years later by Kerry was no less dishonest, no less cynical. Indeed, by comparison, Powell's presentation was a masterpiece of detail. 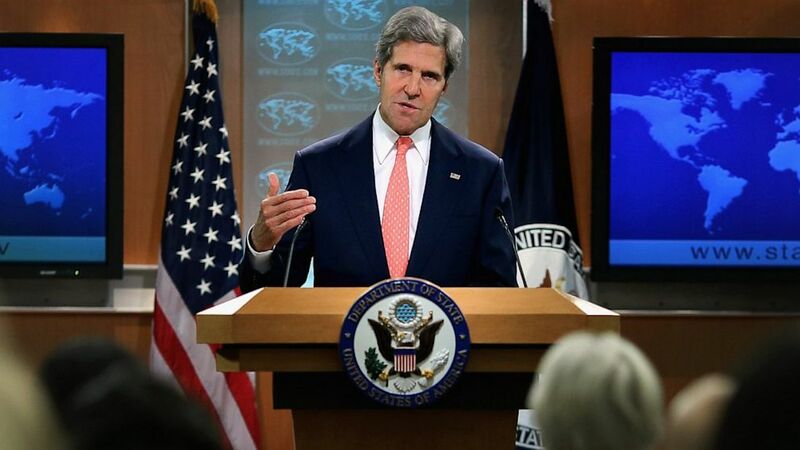 Kerry's entire case against the Syrian regime consisted of a general moral denunciation of chemical weapons. Describing "gut-wrenching images" of casualties from the alleged chemical weapons attack on Ghouta, he said: "The indiscriminate slaughter of civilians, the killing of women and children and innocent bystanders by chemical weapons is a moral obscenity." The United States government and its allies in Britain, France and Germany are in no position to lecture the world on the "moral obscenity" of chemical warfare or anything else. A complete documentation of the war crimes and atrocities carried out by American and European imperialism would fill many volumes. Washington has poisoned entire Iraqi cities with depleted uranium and white phosphorus. Earlier, it dropped 75 million liters of Agent Orange--a chemical weapon--on Vietnam, affecting millions of people. The US is the o ne country in the world that has used nuclear weapons on defenseless cities--not once, but twice, on Hiroshima and Nagasaki. It and the European imperialist powers--who pioneered the use of poison gas--are collectively responsible for the deaths of millions of people. While invoking the "moral obscenity" of indiscriminate killings with chemical weapons, the Obama administration continues to fund the Egyptian military junta, which over the last month has slaughtered thousands of unarmed protesters in the streets. Kerry could not present a single fact, beyond his own lurid allegations, to justify the claim that Syrian President Bashar al-Assad's forces carried out a chemical attack in Ghouta. Instead, he said: "Our understanding of what has already happened in Syria is grounded in facts, informed by conscience, and guided by common sense ... Chemical weapons were used in Syria. Moreover, we know that the Syrian regime maintains custody of these weapons. We know that the Syrian regime has the capacity to do this with rockets." Such arguments prove nothing. Though Kerry preferred not to mention it, it is well known that US-backed opposition militias have access to chemical weapons and have used them. Opposition groups have posted YouTube videos bragging of their ability to manufacture poison gas, and UN officials have repeatedly stated that investigations inside Syria showed that opposition forces, not the Assad regime, were responsible for previous chemical attacks. The CIA, which has been transformed into a heavily-armed global paramilitary organization, has access to such weapons and could easily make them available to the opposition. Kerry's claim that his accusations against Syria are gro unded in "common sense" is false: common sense, applied to the situation in Syria, leads one precisely to the opposite conclusion. The opposition is on the run, losing the war; their only hope is massive military intervention by their backers in the US, Europe and the Middle East. The chemical weapons attack--previously described as a "red line" by the Obama administration--provides the desired pretext for this intervention. In another remarkable statement, Kerry gave a back-handed acknowledgment that Washington does not intend to offer proof of its allegations against Assad. He stated, "as Ban Ki-moon said last week, the UN investigation will not determine who used the chemical weapons, only whether such weapons were used, a judgment that is already clear to the world." That is to say that, regardless of what the investigation shows about the identity of the attackers, Washington will seize upon it as a pre text to attack the Syrian government. After demanding that Syria allow "unrestricted" access to investigate the alleged attack, Kerry responded to the government's acquiescence to this demand by declaring that it doesn't matter anyway, since it was "too late to be credible." All the demands are simply intended to pave the way for war. Short of opening up the country to foreign occupation, there is nothing the government could do to satisfy the ultimatums of US imperialism. Only months after his 2003 speech on Iraq, it was clear that Powell had lied through his teeth. In the months ahead, Kerry, the one-time anti-Vietnam war protester, will also be caught up by the web of lies underlying the US war drive against Syria. US Secretary of State Colin Powell's brief for war against Iraq, delivered Wednesday to the United Nations Security Council, was the latest act in a diplomatic charade laced with cynicism and deceit. The event was predicated on a colossal lie: that the coming invasion is about Iraqi weapons of mass destruction and Baghdad's supposed threat to US security and world peace. All of the assembled delegates were well aware that the Bush administration is committed to carrying out a war for which the most reactionary sections of the American political establishment have been clamoring for more than a decade, and that there is nothing Iraq can do to prevent it. It is a war of colonial conquest, driven by a series of economic and geo-political aims that center on the seizure of Iraq's oil resources and the assertion of US global hegemony. Not since the 1930s, when fascist Italy rap ed Ethiopia, Imperial Japan seized Manchuria and Nazi Germany annexed Austria and the Sudetenland, have imperialist powers so brazenly bullied and attacked weaker countries. The Security Council meeting was staged on false pretences. The American media had promoted the event as a the pivotal moment when the man of the hour, Powell, would unveil secret intelligence to prove to skeptical allies and reluctant Arab regimes that Iraq was defying the UN and had to be "disarmed" by force. In reality, the Bush administration had few illusions that the recycled charges and unsubstantiated allegations crammed into Powell's hour-plus speech would be taken by international leaders as good coin. Powell's own desultory performance underscored the hollowness of his arguments. The overriding purpose of the exercise was to shift public opinion within the US, which is increasingly opposed to the Bush administration's war drive. The White House and Pentagon concluded that they could diffuse domestic anxiety and hostility to their war plans only by intensifying their pressure on the UN to sanction the coming invasion. Such a course would have the added benefit of giving recalcitrant Security Council members such as Russia and France, as well as Democratic Party leaders at home, political cover to drop their criticisms and line up behind the war. The administration was as sured in advance of enthusiastic support from a servile and war-crazed media, which could be counted on to portray Powell's speech as a "devastating" and "irrefutable" case for military action, regardless of its content. The speech contained no new or verifiable evidence to substantiate Washington's charges that the Iraqi regime has amassed chemical and biological weapons and forged an alliance with Al Qaeda. Most of its key allegations have already been refuted, in some cases by US and British intelligence sources and the weapons inspectors themselves. "A typical American show, complete with stunts and special effects," was the apt description given by General Amer Al-Saadi, the Iraqi regime's chief scientific advisor. Among the most cynical lies was Powell's claim to be upholding the authority of the UN and the sanctity of int ernational law. Even as he spoke, the US was building its troop strength in the Gulf to more than 100,000, amassing hundreds of warplanes and assembling a naval armada in the region. Just last week the chairman of the Joint Chiefs of Staff admitted publicly that the US already has troops in northern Iraq, a direct breach of the UN resolution passed last November, which prohibits violations of Iraq's national sovereignty. This is the same resolution the US is invoking to justify its war drive. Only eight days before Powell's speech, Bush declared in his State of the Union address that America would not allow "others" to determine its policies. The president thus restated the US position that it is not bound by any international laws or institutions, and is prepared to attack Iraq with or without UN approval. Powell gave the Security Council an ultimatum: sanction the coming war or place itself "in danger of irrelevance." The secretary of state began his presentation by citing Resolution 1441, and concluded by lying about Washington's motives in pushing for the resolution last autumn. He declared, "We wrote 1441 not in order to go to war, we wrote 1441 to try to preserve the peace." In fact, the US initially opposed the return of weapons inspectors to Iraq, because it saw it as an impediment to an early invasion of the country. Finding itself isolated internationally, the Bush administration agreed reluctantly to demands for a new resolution and the resumption of inspections. But it insisted on provocative language that would strip Iraq of its last shreds of sovereignty and impose such onerous conditions as to make compliance, as a practical matter, impossible. Thus the US, under cover of weapons inspections, fashioned a new legal pretext for war. The first charge leveled by Powell in his speech was t hat the Iraqis were involved in an elaborate strategy of evading inspections and concealing weapons materials and manufacturing facilities. To substantiate this allegation, he played two audiotapes of conversations between unidentified males speaking in Arabic, which he alleged represented a conspiracy by Iraqi military officers to hide weapons. The tapes, unintelligible to the vast majority of those who heard them, were presented with no context, nor any verifiable identification of those whose voices were heard. While the words are open to interpretation, referring to a "modified vehicle" in one instance and instructions not to mention the words "nerve agent" in another, there is no way of knowing if the tapes themselves are genuine. They could have been made in a sound studio in Langley, Virginia, or they could involve a careful editing of words actually spoken by Iraqi officers. Powell went on to d isplay blowups of satellite photos, claiming they showed "active chemical weapons bunkers" and trucks being used to conceal weapons materials. He was, however, compelled to admit that the photos "are hard for the average person to interpret, hard for me," and could only be understood by "experts with years and years of experience poring over light tables." The weapons inspectors already possess similar satellite imagery, if not the identical photos. Nevertheless, they maintain they have found no such evidence of concealment of active weapons programs. Powell's use of taped telephone intercepts and spy satellite photos raised an obvious question that none of the media commentators addressed. Washington is continually monitoring virtually every inch of Iraq from the air, is able to intercept the most sensitive telephone conversations, has spies on the ground, and scores of weapons inspectors arriving una nnounced at factories, government offices, farms and private residences. If, as the US claims, Iraq is hiding vast stores of chemical and biological weapons and producing new weapons of mass destruction, why is the secretary of state--despite the massive US surveillance--unable to produce physical proof of a single such weapon? There is only one plausible answer: the US government is employing the technique of the Big Lie. The Iraqi military has ample cause to distrust the inspectors. During the last round of inspections, it was established that US intelligence agents were secretly accompanying the UN teams and using the process to prepare attacks on Iraq. Information gathered was also relayed to Mossad, the spy agency of Israel. In a similar vein, Powell charged that Iraq's refusal to allow American-piloted U-2 spy planes to conduct surveillance over the country was another proof of guilt. The demand that the country submit to this spying operation is made even as US and British warplanes conduct daily bombing raids--in violation of the UN resolutions on Iraq--in the so-called "no fly zones" imposed over the north and south of the country. The purpose of these attacks is to eliminate all of Iraq's air defense capabilities in advance of a US invasion. Meanwhile, leaked Pentagon reports have revealed plans for an aerial bombardment of Baghdad that is to be more horrific than anything seen since the dropping of the atomic bomb on Hiroshima in 1945. Some 800 cruise missiles are to be fired into this city of five million during the first two days of a US attack, more than all such weapons used during the entire 40-day Persian Gulf War a decade ago. In any event, it is not true that Iraq has rejected the U-2 flights. It has agre ed to them, on the condition that the US and Britain suspend their flights in the no-fly zones while the spy planes are operating. The US has flatly rejected any such condition. As further evidence of a lack of cooperation by Baghdad, Powell cited the refusal of Iraqi scientists to participate in a US scheme to spirit them out of the country for "interviews" with the CIA. He attributed the lack of participation in this bizarre proposal solely to the threat of retaliation from Saddam Hussein. That scientific professionals in Iraq might not want to help the US prepare a war that will claim the lives of thousands of their countrymen and reduce Iraq's cities to rubble is not, according to the US, a possibility worth discussing. The "most worrisome" discovery supposedly made by US intelligence was the existence of mobile biological weapons labs that are allegedly moved around the country on trucks and railr oad cars to avoid detection. The evidence of the existence of these rolling labs came, he said, from Iraqi defectors. The day before Powell's speech, Chief UN weapons inspector Hans Blix dismissed the US claims of mobile laboratories, as well as the charge that Iraqis were moving prohibited materials out the back door as inspectors were coming in the front. He noted that the inspection teams perform extensive and sensitive tests, taking air, soil and water samples that would reveal traces of chemical and biological materials at a suspected site, even if the materials had been removed. Blix said that samples tested--including at sites identified by US intelligence--have provided no evidence of prohibited materials. In relation to both chemical and biological weapons, Powell charged that the Iraqi regime had failed to account for thousands of liters and hundreds of tons of materials dating back to the Ir an-Iraq war more than 15 years ago. The vast majority of Iraqi weapons materials from this period were either expended in the Iran-Iraq war itself, destroyed in the Persian Gulf war of 1991, or incinerated by weapons inspectors in the last inspections round. According to former inspector Scott Ritter, this accounts for between 90 and 95 percent of these materials. Even it were true that Iraq had managed to hide what little remained, most of these substances have a shelf life of five years or less, meaning that they would now be useless. What facilities Iraq had for producing these weapons were destroyed more than 10 years ago, and there is no evidence whatsoever that any new facilities, which would be extremely difficult to hide, were ever created. On the allegations concerning an Iraqi nuclear arms program, Powell regurgitated old US allegations--already rejected by UN inspectors--concerning Iraq's pu rchase of aluminum tubes that he said were to be used as centrifuges for enriching uranium for nuclear weapons production. Acknowledging that experts in the field had rejected this charge, the US secretary of state asserted that the Iraqis were seeking out higher standard tubes, and claimed this was evidence of guilt. He noted that the last batch detected by US intelligence included an "anodized coating" on their surface. Nuclear experts, however, have pointed out that this coating would actually interfere with the tubes' use as centrifuges, and would have to be removed if they were employed for this purpose. To buttress the US case, Powell repeated the discredited claims that Iraq is secretly abetting Al Qaeda terrorists. Initially, US officials claimed that Iraq was complicit in the September 11 attacks on New York and Washington, citing reports of a meeting of the plot's alleged ringleader, Mohammed Atta, with an Iraqi diplomat in Prague. This "evidence" was subsequently repudiated by both US and Czech intelligence officials as a fabrication. Powell's new "proof" was undercut by a British Broadcasting Corporation report the day of the speech citing a British intelligence document that dismissed any relation between the Iraqi regime and Al Qaeda. Powell's case supporting such a relationship was built on an improbable amalgam, citing the existence of an Islamist group in northeastern Iraq--where the US maintains its no-fly zone and Baghdad exerts no control--and claims that figures linked to Al Qaeda had been spotted in Baghdad. There are two sources for these unsubstantiated charges. The first is the Kurdish authority in the northeast of the country, which is fighting a low-level civil war with the Islamists and has am ple motive to tie them to the Saddam Hussein regime. The second, as acknowledged by Powell, consists of the detainees seized by US forces in Afghanistan or abducted from other countries and handed over to allied governments for interrogation. These people are being held incommunicado, in solitary confinement, without being charged or tried, and without access to lawyers. Numerous reports, including some in the American press, have acknowledged the use of psychological and physical torture against such prisoners. The testimony of such individuals, even if its existence were independently verified, would not be credible. Finally, as proof that "Saddam Hussein and his regime will stop at nothing until something stops him," Powell repeated the charge that the Iraqi regime deliberately massacred 5,000 Kurdish men, women and children in 1988, using chemical weapons to kill them. Once again, Powell's allegations were debunked in advance by evidence to the contrary, offered, in this case, by Stephen Pelletiere, who was the CIA's senior political analyst on Iraq during the Iran-Iraq war. In a column published January 31 in the New York Times, Pelletiere responded to this same accusation leveled by Bush in his State of the Union speech. The gassing of Kurdish civilians in the town of Halabja, he wrote, took place in the midst of a battle between Iraqi and Iranian forces, both of which were using chemical weapons against each other's troops. "The Kurdish civilians who died had the misfortune to be caught up in that exchange," he wrote. "But they were not Iraq's main target." He went on to note that the US Defense Intelligence Agency conducted its own study of the incident and issued a classified report charging that it was Iranian--not Iraqi--gas that killed the Ku rds. To this it need only be added that Powell's ally to the north of Iraq, Turkey, has for more than a decade been conducting a bloody war against its own Kurdish population. Within minutes of Powell's speech, leading Senate Democrats such as Joseph Biden of Delaware and Diane Feinstein of California were proclaiming it an unanswerable indictment of Iraq, preparing the way for their party to line up behind the war that is now only days or weeks away. The entirely predictable trajectory of the Democrats underscores the fact that opposition to the impending slaughter in Iraq and future imperialist wars cannot be based on any section of the political establishment. It requires a struggle for the independent mobilization of the American working class in unity with the workers and oppressed masses internationally against the capitalist system that breeds militarism and war. The following is the text of a report given to the Detroit-area membership of the Socialist Equality Party on August 18, 2013. David North is the national chairman of the Socialist Equality Party and chairman of the International Editorial Board of the World Socialist Web Site. Commenting has been enabled at the bottom of this article. On August 9, President Barack Obama opened his press conference with a defense of the National Security Agency's spying on the American people. Once again, Obama resorted to lying and dissembling in defense of his administration's actions. Referring to the Patriot Act, he declared that "it does not allow the government to listen to any phone calls without a warrant." Whatever it is that the Patriot Act may or may not formally allow, Obama ignored the indisputable fact that the government is listening in to tens of millions of phone calls every day. The most striking feature of Obama's remarks is what they revealed about the president himself. Obama is the personification of the state military-intelligence bureaucracy. His mind is that of an intelligence analyst. Every other aspect of his public persona is a forced and unconvincing act. His world view is the residue of the countless high-level secret dossiers that have for many years constituted his chief intellectual nourishment. One has the impression that an intelligence briefing is Obama's preferred form of inter-personal communication. We have been told that Obama taught constitutional law at the University of Chicago. One can only wonder what his lectures on the subject consisted of. The press conference of August 9 gave no indication that he understands, or that he is concerned with, the US Constitution. Whether one or another action of his administration or state agencies is legal, i.e., constitutional, is to Obama a matter of indifference. All constitutional issues are seen by Obama not as matters of legal substance but, rather, merely problems of public perception. It is not the actions of the state that need to be changed, but the perceptions of the American people. For Obama, it is never a matter of upholding the law as defined by the Constitution, let alone prosecuting those responsible for an abuse of the people's democratic rights. The task of the president, as understood by the present White House occupant, is to change public opinion without impinging upon the power and prerogatives of the vast state intelligence-gathering agencies. Therefore, the fact that Americans are alarmed by NSA spying does not, for Obama, require an end to the spying. No, it requires only that Obama have "a dialogue with members of Congress and civil libertarians" in order "to give the American people additional confidence that there are additional safeguards against abuse." Obama declared that he would "work with Congress to improve the public's confidence" in the Foreign Intelligence Surveillance Court, a thoroughly discredited institution that exists only to provide a veneer of judicial window-dressing to blatantly unconstitutional activity. In Obama's world, a criminal act can be made legal simply by having it blessed by a judge. There is a well-known film, Cool Hand Luke, which was made in 1967, starring Paul Newman. It is set in a southern prison camp. The prisoners are watched by rifle-toting guards as they toil in miserable conditions unshielded from the burning sun. They are ruled over by a mad and sadistic warden. He responds to every expression of discontent and resistance with savage violence. And after administering a beating, the warden, affecting a tone of compassion and reasonableness, declaims before the horrified prisoners who witnessed the bloody episode: "What we've got here is failure to communicate!" This phrase could serve as Obama's motto. The problem, as he sees it, is not the spying, but the public's reaction to it. Thus, what is required is not an end to the criminal behavior of the state, but, rather, better communication techniques. "We can, and must," Obama proclaimed, "be more transparent." With evident self-satisfaction, Obama stated: "So I've directed the intelligence community to make public as much information as possible." The caveat "as much information as possible" really means no more than is absolutely necessary. Obama also announced that at his direction, "the Department of Justice will make public the legal rationale for the government's collection activities under Section 215 of the Patriot Act." There is still more: "The NSA is taking steps to put in place a full-time civil liberties and privacy officer, and release information that details its mission, authorities, and oversight." His mind ablaze with bureaucratic initiatives, Obama promised a "web site that will serve as a hub for further transparency" as well as "a high-level group of outside experts to review our entire intelligence and communications technologies." The central task of this group is to "consider how we can maintain the trust of the people..." All these steps, Obama explained, "are designed to ensure that the American people can trust that our efforts are in line with our interests and our values." Lest anyone doubt his sincerity, Obama declaimed: "I want to make clear once again that America is not interested in spying on ordinary people." This was stated on the very day that fresh revelations exposed the fact that the government trolls through millions of e-mail communications sent by private citizens. "The question," Obama said, "is how do we make the American people more comfortable." He seemed genuinely puzzled by the distrustful attitude of the public. Why are they not comfortable? After all, he explained, "I am comfortable that the program currently is not being abused. I'm comfortable that if the American people examined exactly what was taking place, how it was being used, what the safeguards were, that they would say, you know what, these folks are following the law and doing what they say they're doing." And let me close with one additional thought. The men and women of our intelligence community work every day to keep us safe because they love this country and believe in our values. They're patriots. Most commonly the discussion of power [among the colonials] centered on its essential characteristic of aggressiveness: its endlessly propulsive tendency to expand itself beyond legitimate boundaries. In expressing this central thought, which explained more of politics, past and present, to them than any other single consideration, the writers of the time outdid themselves in verbal ingenuity. The image most commonly used was that of the act of trespassing. Power, it was said over and over again, has "an encroaching nature;" "... if at first it meets with no control [it] creeps by degrees and quickly subdues the whole." Sometimes the image is that of the human hand, "the hand of power," reaching out to clutch and to seize: power is "grasping" and "tenacious" in its nature; "what it seizes it will retain." Sometimes power "is like the ocean, not easily admitting limits to be fixed in it." Sometimes it is "like a cancer, it eats faster and faster every hour." Sometimes it is motion, desire and appetite all at once, being "restless, aspiring, and insatiable." Aside from the inappropriateness of Obama's invocation of "our values" as a legitimate basis for public trust in the actions of the state, one must wonder what he considers these "values" to be. During the past decade, these supposedly shared values have found expression in the launching of wars based on lies, the torture of prisoners, the sexual abuse of inmates at Abu Ghraib, the practice of rendition, and the killing of hundreds of people, including four Americans, without due process of law. If the values of Obama and his cohorts were really those of the American people as a whole, then one could justly conclude that the United States is a nation of torturers and murderers. But we reject this Americanized version of the Goldhagen thesis. Obama represents not the American people, but the capitalist state and its vast military-police apparatus of control and repression. At one point in his press conference, Obama alluded to the chasm that separates him from the citizenry. He acknowledged that "if you are outside of the intelligence community, if you are the ordinary person and you start seeing a bunch of headlines saying, US-Big Brother looking down on you, collecting telephone records, et cetera, well, understandably, people would be concerned. I would be, too, if I wasn't inside the government." But Mr. Obama is, of course, "inside the government." More than that: the government is inside President Obama. It is the spirit of the state, of its intelligence-gathering bureaucracy, that stirs within him. He sees the world through its eyes, and has embraced its objectives as his own. That is why this most passionless of presidents evinced at the press conference an observable degree of personal emotion only when asked about Edward Snowden. "No," he declared with visible anger, "I don't think Mr. Snowden was a patriot." And there's no doubt that Mr. Snowden's leaks triggered a much more rapid and passionate response than would have been the case if I had simply appointed this review board to go through, and I had sat down with Congress and we had worked this thing through. What Obama dismisses contemptuously as "this thing" is nothing less than his administration's violation of the Constitution, a "high crime" that, were it not for the putrefaction of American democracy, would have by now led to the drafting of articles of impeachment. But that will not happen. Not only the president, but leading members of the Senate and House of Representatives have accused Snowden of treason--that is, the betrayal of the secrets of the state to its most feared enemy: the broad mass of the American people. In another passage, Marx describes the state bureaucracy as "a circle from which no one can escape." But, in an act decried by Obama and the lackeys of the state intelligence bureaucracy and the establishment media, Snowden, the 30-year-old "political-minded" man, sought to escape this circle and exposed the crimes committed by those within it against the people. That is what his "treason" consists of. This "treason" was an act of great courage. Therefore, the defense of Edward Snowden against his persecutors must be taken up by the working class. ...the more the bourgeoisie abandons democracy, the more it is unable to adhere to even its own traditional democratic forms, the more does the struggle for democracy assume revolutionary significance. I argued that it was necessary to encourage the democratic aspirations of the working class without adapting to their political illusions in the existing state. Nearly a quarter-century has passed since the First Gulf War, and the breakdown of democracy is far more advanced. This finds expression not only in the actions of the state, but in the virtual disappearance of a genuine democratically-minded intelligentsia. There exists today no equivalent of a John Dewey, an H.L. Mencken, a William Allen White (of the Emporia Gazette) or a Sinclair Lewis. The economic disintegration of the middle class over the last half-century has eliminated the social foundation which formed the basis for a broad-based democratic public opinion. The public intellectuals, small-town lawyers, editors and even businessmen whose petty-bourgeois avarice was tempered by gripes against the "unfair competition" of big corporations and who were, therefore, at least slightly receptive to democratic reforms have largely disappeared from the scene. The media is nothing more than the means of disseminating corporate-state propaganda. The fusion of state intelligence agencies and media news is epitomized by such figures as Bill Keller, Thomas Friedman, and C.J. Chivers of the New York Times, George Stephanopoulos of ABC News, and the ineffably disgusting Wolf Blitzer of CNN. Today, there is mounting outrage over the tweet sent out on Saturday night by Mike Grunwald, a senior national correspondent of Time Magazine, in which he wrote: "I can't wait to write a defense of the drone strike that takes out Julian Assange." Grunwald's views are not exceptional. In a media utterly subservient to the state, authoritarian and fascistic inclinations are hardly an impediment to advancement. David Gregory of NBC News asked Glenn Greenwald why he, too, should not be indicted for having provided assistance to Snowden. There is hardly a prominent establishment journalist who would not be ab le to continue his or her lucrative career if a military dictatorship was established in the United States. While the social disintegration of the democratic petty-bourgeoisie has eroded the base for bourgeois democracy, the proletarianization and, therefore, class polarization of society--within the United States and internationally--has vastly expanded the potential social constituency for a revolutionary movement for a democratic society based on socialism. Indeed, it is only through the development of such a movement, based on the working class, that democratic rights can be defended. There is an inextricable link between the attack on core constitutional rights and the crisis of capitalism. As the ruling class seeks to impose the burden of the crisis on the working class, it is driven to dispense ever more openly with the forms of democracy. In Detroit, all effective executive power has been transferred to a hand-picked and unelected representative of the banks. The elected officials, such as the mayor, have been stripped of all power. The capitalist class demands a free hand to pursue its interests within the borders of its "own" country as well as internationally. Arguments in favor of authoritarianism are being advanced more insistently in the media. Is it not necessary, it is being asked, to find a way out of congressional "gridlock"? Hasn't the time come for "someone" to make the "hard decisions" necessary to eliminate budget deficits, i.e., to slash pensions, medical care and other social services? Such arguments are advanced to prepare the ground for dictatorship. Capitalism and democracy are incompatible. The one can exist only if the other is destroyed. The destruction of democracy by capitalism would signify the establishment of a fascistic police state regime. The defense of democracy is possible only within the context of a struggle against capitalism, for the establishment of workers' power and socialism. 5. The reference is to the historian Daniel Goldhagen's book, Hitler's Willing Executioners. Goldhagen's thesis was that the Nazi extermination of the Jews was carried out with the enthusiastic support and participation of "ordinary" Germans. This argument has been widely discredited. See: A Critical Review of Hitler's Willing Executioners. The US-backed Egyptian military junta's release of former dictator Hosni Mubarak yesterday, more than two years after he was toppled by mass revolutionary struggles of the working class, symbolizes the advance of counterrevolution in Egypt since the July 3 coup. The junta is acting with brazen contempt for popular hatred for Mubarak, in line with its hostility to every demand of the working class. Since the coup, it has massacred over 1,000 unarmed protesters in several bloody crackdowns and announced plans to slash key subsidies, drastically increasing bread and fuel prices for workers. As Mubarak was flown by helicopter to a military hospital in Cairo, the affluent and rich could barely contain their euphoria. While "Mubarak's release, attributed to a legal technicality, would have provoked mass outrage in the months after Egypt's 2011 popular uprising ," the Washington Post noted, "some met the court decision with nostalgia for Mubarak's order." Two years after the eruption of one of the truly great revolutionary upsurges of the modern epoch, the political situation seems to have been thrown far back. The critical questions are: how was this possible, and who is responsible? In February 2011, massive crowds in Tahrir Square fought off Mubarak's thugs, brought down his regime, and sang paeans to the unity of the people and of the army. As masses of people assembled, drawn from varied segments of society and reflecting different class interests, it was a time of political illusions. Those whose voices predominated in the media were largely intoxicated with vague democratic sentiments, hopes for a more lenient regime, and plans for a redistribution of the wealth of Mubarak and his cronies. Beyond this, however, masse s of impoverished workers and the urban and rural poor understood democracy as a way to effect far deeper changes in society. The working class--the decisive force behind the 2011 revolution--became ever more insistent after it toppled Mubarak. While the years before the revolution saw approximately 200 strikes per year, and 2011 saw over 1,000 strikes, 2013 has seen a record-breaking 5,500 strikes and social protests. This ultimately culminated in demonstrations of millions of Egyptians against Islamist President Mohamed Mursi's unpopular regime, starting on June 30. The affluent middle class recoiled in horror and anger, fearing for their social position as they realized that the demands of the working class went far beyond their own concerns over lifestyle, for more sexual freedom or access to more expensive goods at the mall. They gave up play-acting at revolution and received Mubarak and junta leader Ge neral Abdel Fattah al-Sisi as their saviors. To combat the spreading radicalization of the working class, they rented themselves out to the rich, hatching the Tamarod ("Rebel") conspiracy. Tamarod was a coalition including supporters of the late Egyptian intelligence chief and CIA torturer General Omar Suleiman; ex-Mubarak regime officials like Amr Mousa and General Ahmed Shafik; Coptic billionaire Naguib Sawiris and the liberal National Salvation Front of Mohamed ElBaradei. A critical role in this reactionary swindle was played by an organization embodying pseudo-left political charlatanry, the so-called Revolutionary Socialists (RS). This group--which functions as a political instrument of the AFL-CIO bureaucracy, different media interests, and dubious non-governmental organizations--threw itself behind Tamarod, seeking to give it credibility. While Tamarod prepared a "roa d map" for the July 3 coup in weeks of talks with the generals, the RS gave it political cover, promoting it as "a group of revolutionary youth ... opening up space for revolutionary work and experience from below." The RS and other youth groups and parties inside Tamarod constantly presented preparations for a counterrevolutionary coup as a "revolutionary" response to popular hostility to Mursi. The WSWS warned of the reactionary role Tamarod and its allies sought to play in the mass protests after June 30. Noting that "The protests are politically dominated by the 'Tamarod' ('rebel') platform, which is backed by various liberal, Islamist, and pseudo-left parties and remnants of the Mubarak regime," the WSWS wrote before the coup that the political coalition envisaged by the military "would serve to delegitimize pr otests and give the military time to prepare a more violent crackdown." Events proved the WSWS' warnings about the army and the RS correct. By working to direct opposition to Mursi behind the perspective of a coup, they helped drive a shift of broad sections of the petty bourgeoisie into the camp of dictatorship and counterrevolution. These are the conditions in which it is possible for the junta to rehabilitate Mubarak. The RS epitomize a type of reactionary pseudo-left politics that spouts leftish phrases but supports the bourgeoisie. During the two years of the Egyptian revolution, they have found themselves in alliance with every right-wing faction of Egypt's political establishment, whether in the army or the Muslim Brotherhood. The only consistent theme of their politics has been their vehement opposition to an independent movement of the working class. The Egyptian re volution provides a comprehensive refutation of their entire perspective. The working class has played the central role in the revolution, again and again mounting powerful offensives. Without a revolutionary party to lead it, however, the working class was left disoriented and unprepared to successfully oppose the pseudo-left's latest reactionary maneuvers. Once again, a great revolutionary experience has underscored the significance of Leon Trotsky's Theory of Permanent Revolution. This theory holds that in countries of belated capitalist development, the struggle for democracy can only be victorious as a politically independent struggle of the working class for socialism, led by a mass revolutionary party; and that the victory of revolution in any country is only possible on the basis of an international strategy to unify the world working class. The working class has unquestionably suffered a significant setback. The military will seek to impose order. However, the Egyptian revolution has not yet run its course, nor has the working class said its last word. Raising Mubarak from the grave will not breathe new life into the sclerotic veins of Egyptian capitalism, let alone resolve the conflicts in the Middle East provoked by imperialist wars and the deepening crisis of global capitalism. The bourgeoisie, which cannot hold power save when protected by the tanks of the Egyptian army, stands discredited as a force for democracy. The decisive question remains the building of a political leadership in the working class to prepare for the struggles to come. This means the construction of sections of the International Committee of the Fourth International in Egypt, throughout the Middle East, and internationally. Fred Mazelis is a founding member of the Workers League, the predecessor of the Socialist Equality Party. He has played a leading role in the Trotskyist movement for over 50 years and participated in the 1963 March on Washington. He presents here his views on the significance of that event and the subsequent social and political evolution of the United States. 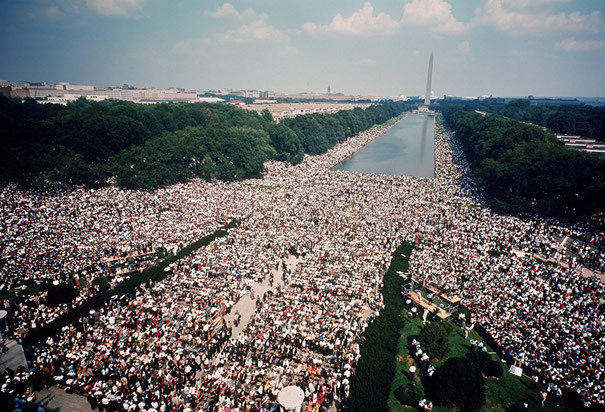 Today's rally at the Lincoln Memorial is part of a weeklong commemoration of the August 28, 1963 March on Washington. The glaring contrast between the commemoration and the event that it is commemorating is epitomized in their keynote speakers. In 1963, Martin Luther King, Jr. electrified a crowd of a quarter of a million with his "I have a dream" speech. Fifty years later, Barack Obama will deliver an oration Wednesday tha t, if he were honest, would replace King's famous refrain with "I have a drone." King spoke as a courageous champion of democratic rights and an opponent of inequality and war. Obama represents America's military and intelligence apparatus, which orders assassinations, military aggression and police state measures at home. He speaks not as the leader of a movement from below, but as a defender of the corporations, Wall Street banks and super-rich. While Obama, the first African American US president, is hailed as the towering achievement of the civil rights movement, his presidency in fact represents a final nail in the coffin of this movement. This 50th Anniversary commemoration is a mockery of the sacrifices of the mass civil rights movement of the early 1960s. It has been organized by a collection of opportunists and scoundrels who have devoted most of their political care ers to exploiting the symbols of the civil rights movement--including the memory of King--to win political positions and, above all, make millions of dollars for themselves. The 1963 March on Washington for Jobs and Freedom was one episode in a mass movement that spanned the period from the Montgomery Bus Boycott of 1955 to the assassination of King in 1968. The attitude of the capitalist ruling class and its political representatives to this movement was one of fear and distrust. They sought to contain and co-opt the demonstrations and acts of civil disobedience; the student sit-ins and Freedom Rides; the voter registration drives; and the struggles for jobs and against poverty. The original March on Washington had something of a semi-official character. While it attracted a crowd of 250,000, at that time virtually unprecedented for the capital, it was also endorsed by the most important sections of the political establishment. The Kennedy administration, after trying behind the scenes to have the demonstration called off, then gave its uneasy approval. The March reflected the contradiction between the rank and file of the movement--the masses of Southern black workers and their Northern allies--and the conservative African American leadership represented especially in such organizations as the NAACP and the Urban League. King and his Southern Christian Leadership Conference sought to balance between the conservative leaders and the more radical youth and young workers who drove the movement forward. The Student Non-Violent Coordinating Committee and Malcolm X, though far from presenting a class perspective in the fight against Jim Crow racism, nevertheless reflected the anger and militancy that would explode in the urban ghetto rebellions of 1964-68. King sought to pressure the ruling class and the Kennedy administration in particular, to put an end to segregation in the South. The 1963 March was designed to discipline the mass movement, and to channel it behind support for the Democrats. The passage of the Voting Rights Act and the Civil Rights Act in the two years following Kennedy's assassination were among the last gasps of American social reform. King, however, was a serious political figure whose concerns extended beyond segregation. He understood that the civil rights legislation, far from solving the historic problems of inequality, exposed deeper issues and raised more political and social issues. In the last years of his life, the civil rights leader took a different path, which brought him into conflict with previous allies, including the NAACP and the administration of Lyndon Johnson. King became a fervent opponent of the war in Vietnam. He turned increasingly to the class issues of poverty and inequality. Just months before his assassination in April 1968, he launched the Poor People's Campaign. King planned to build a movement uniting white and black workers in the fight for jobs and decent living standards. He began to denounce capitalism as the source of poverty and inequality. In a 1967 speech delivered in Atlanta, Georgia explaining his opposition to the Vietnam War, King advocated a "shift from a thing-oriented society to a person-oriented society," warning, "When machines and computers, profit motives and property rights are considered more important than people, the giant triplets of racism, militarism and economic exploitation are incapable of being conquered." In another 1967 speech he asked why there were 40 million poor people in what was then the wealthiest country in the world. "When you begin to ask that question, you are raising a question about the economic system, about a broader distribution of wealth," he said. "When you ask that question, you begin to question the capitalistic economy. And ... when you deal with this you beg in to ask the question, 'Who owns the oil?' You begin to ask the question, 'Who owns the iron ore?'" There is little doubt--and this is a view shared by millions throughout the world--that King paid with his life for his challenge, even if an inconsistent one, to the profit system. The stage managers of this week's events in Washington are the antithesis of King. In the aftermath of King's death, the civil rights movement repudiated the more radical aims that King had espoused. They embraced the policy of "black capitalism" pioneered by Richard Nixon, and affirmative action, a more "left"-sounding version of the same strategy. Many are now multimillionaires. The goal of the new post-King orientation was not the elimination of mass poverty, but the securing of special privileges for a very small minority of the African American population. Th e striving for personal wealth and privilege by working within the capitalist system produced a generation of cynical self-promoters (Jesse Jackson, Al Sharpton), corrupt politicians (from Coleman Young to Cory Booker), ruthless servants of US imperialism (Colin Powell and Condoleezza Rice) and vicious opponents of democratic rights and advocates of a police state (Clarence Thomas, Eric Holder and Barack Obama). The masses of black workers have seen their real incomes fall to below what existed when King lost his life 45 years ago, even as the social chasm dividing wealth and poverty among African Americans has grown wider than in society as a whole. Nothing symbolizes this process more starkly than the fate of the city of Detroit, presided over for decades by black mayors and police chiefs as jobs and living standards were wiped out. Detroit is now being taken into bankruptcy by Emergency Manager Kevyn Orr, an African American hatchet-man for the big banks. The Achilles' heel of the civil rights movement, and even its most radical and sincere representatives such as King, was its failure to break with the Democratic Party and recognize that the aims of social equality and democratic rights were realizable only in a struggle for socialism. Along with Jackson, Andrew Young and other erstwhile civil rights figures, a crucial role was played by the AFL-CIO trade unions. The union bureaucracy, in 1963 at the height of its power and influence, worked night and day to keep the working class chained to the Democrats and through that party to the needs of the US banks and corporations. Now, through their support for the Democratic Party and the administration of Barack Obama in particular, demagogues like Jackson and Sharpton are reliable defenders of capitalist exploitation. In the weeks leading up to the commemoration this week, the media pundits have speculated on what Obama could say that would not draw an unfavorable comparison with King's 1963 speech. But this is not merely a matter of eloquence. In the months before his death, King declared that the US had "committed more war crimes almost than any nation in the world" and was its " greatest purveyor of violence." There is an unbridgeable gulf between King's struggle against imperialist war and Obama's role as president. The democratic and social struggles with which the civil rights movement was identified half a century ago can be carried forward today only in a struggle against the political and social forces behind the official commemorations in Washington, and only on the basis of a new mass movement committed to uniting the working class in the struggle for socialism.